We’ve seen it twice before from Chaminade-Madonna cornerback Te’Cory Couch, but the rising four-star senior wants his commitment to the Miami Hurricanes to be his last. Couch, previously committed to Tennessee and Michigan, announced a pledge to UM on Twitter on Saturday afternoon. “This has been a crazy process for me and my family with all the committing and decommitting but this recruiting process is nowhere near easy when making a decision that you feel will help you reach every aspect of your goals in life,” Couch wrote on Twitter, adding a hashtag of “#MAKETHECRIBGREAT,” words American Heritage defensive tackle Nesta Silvera made famous in sticking with the Hurricanes last National Signing Day. Couch decommitted from the Wolverines on June 9. He was approaching two months as a Michigan commit at the time, flipping from Tennessee. He originally committed to the Volunteers’ previous coaching staff last June. 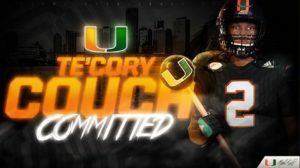 Couch becomes the third Chaminade 2019 prospect committed to the Hurricanes, joining defensive end Cameron Williams and safety Keontra Smith, and fourth overall with lineman Willie Moise committed for the 2020 cycle. He likes the pipeline being developed between the Hollywood private school that is a reigning Class 3A state champ and Miami. Couch, a long-armed, 5-foot-10, 163-pound cover cornerback, has been a key component to the Lions’ success since his sophomore season when he started and was a first-team All-County selection on Chaminade’s state runner-up team. That year, he led the team with six interceptions. As a junior last season, Couch had two interceptions, 25 pass deflections, 57 tackles and a sack. 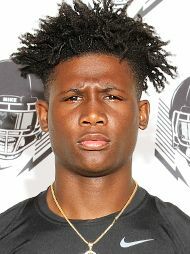 In addition to his Chaminade teammates, he joins three St. Thomas Aquinas defenders — linebackers Anthony Solomon and Avery Huff and defensive end Jason Munoz — committed to UM in a class ranked eighth nationally by 247 Sports with 15 commitments. He’s the second cornerback in the class after Miami Carol City’s Jarvis Brownlee committed last week.